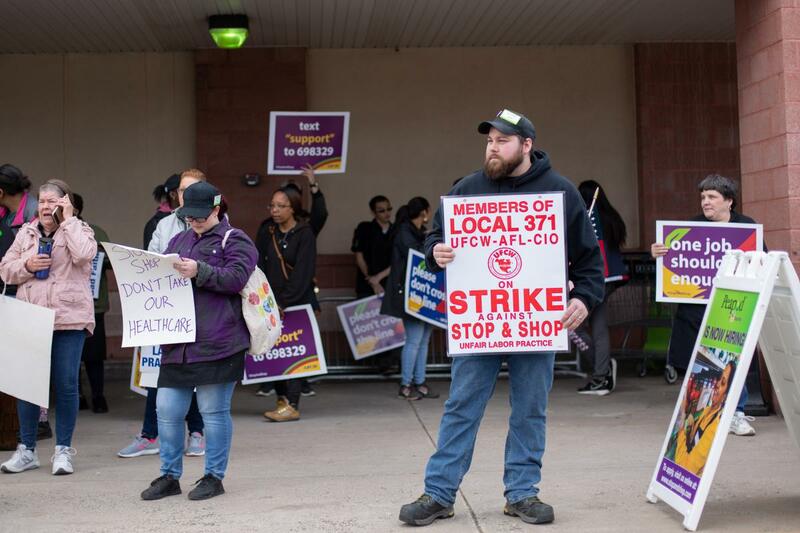 Catherine Velez, who is a Stop & Shop Peapod employee, joined her coworkers in East Hartford, Connecticut, as they went on strike against the company on Thursday, April 11, 2019. 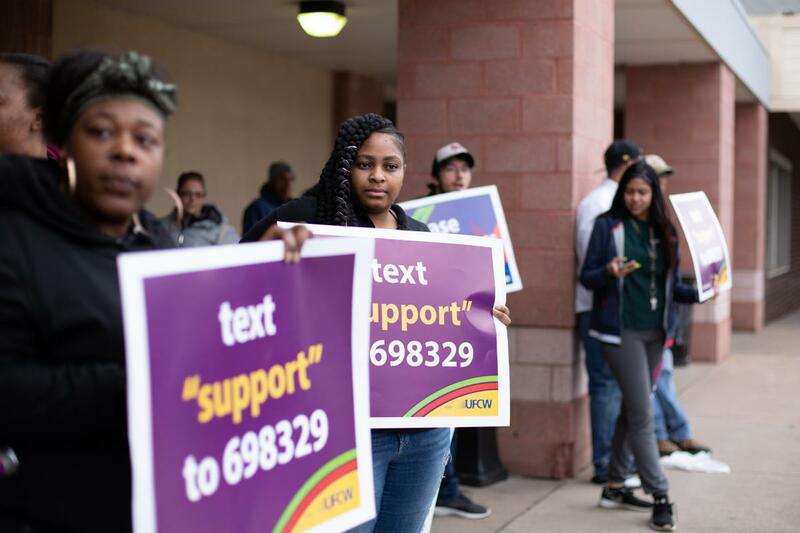 Stop & Shop unionized workers in East Hartford, Connecticut, on strike as the parent company continues contract negotiations with unions for employee benefits. Steven Blank works in the meat department at the Stop & Shop in East Hartford, Connecticut. He joined co-workers as they walked out Thursday. A Stop and Shop in the Elmwood section of West Hartford, Connecticut, is one of the retailer's 91 Connecticut stores where workers walked off the job Thursday. The store's employees were among unionized workers at Stop & Shop stores across Connecticut, Massachusetts and Rhode Island who walked off the job Thursday, after weeks of tense contract negotiations with the supermarket chain that have so far failed to yield a new contract. "I believe they [Stop & Shop] are not trying their best to work out an agreement," said Vanessa White, an employee of the East Hartford store for 16 years. The United Food and Commercial Workers Union said 240 stores across the three states are affected by the stoppage. The union represents 31,000 Stop & Shop workers in the region. The Massachusetts-based company, which is owned by a Dutch parent Ahold Delhaize, this week proffered what it said was a final offer in the talks. The two sides have been far apart on wages and benefits for a new contract to replace one that expired in February. The union claims the company's offer is unacceptable, because it asks employees to increase their contributions to health care benefits, reduces pension benefits for new hires, and limits wage increases for part time workers to less than two percent. White said her job helps support her two children, and for the most part, she's liked working for the company — until now. "I can bring my actual business somewhere else, but I chose to stay here because of the benefits being so good," she said, "but without the benefits, then what's the company, you know?" The five union locals involved in the strike action issued a statement, saying, "instead of a contract that recognizes the value and hard work that our members provide every day, Stop & Shop has only proposed drastic and unreasonable cuts to health care benefits and take-home pay, while replacing real customer service with more serve-yourself checkout machines." For its part, Stop & Shop said the strike action is disappointing, because negotiations are still continuing with the help of federal mediators. "In contrast to the company’s proposal which is better than most recent UFCW contract settlements and responsive to heavy non-union competition, the unions proposed a contract that would increase the company’s costs," said a statement from Stop & Shop. "This would make our company less competitive in the mostly non-union New England food retail marketplace." But workers on strike Thursday said their priorities are to protect things like time off, health care, fair wages and other benefits in order to making a decent living in a state as expensive as Connecticut. Catherine Velez stood at the curb's edge out front of the East Hartford store. She held signs that read, "ON STRIKE Bargaining in Bad Faith" and "One job should be enough." Cars honked in support as they drove by. "I'm fortunate to have a good living situation, but if I didn’t, I would be in a lot of trouble," said Velez, who works for the store's Peapod grocery delivery services. "I certainly would not be able to work this job." Amy Lepage and Becky Hernandez were at the store in support of their mother, a Stop & Shop employee. They worried about how their mother's health care and pension would be affected by a new contract, especially as she nears retirement. Lepage, who lives in East Hartford, said the contract problem and subsequent strike goes beyond the employees—community residents and customers will suffer, too, if the dispute goes on and stores remain closed. The union hasn't indicated how long workers could remain on strike. The company said it remains ready and available to meet with union locals. This report was originally published by Connecticut Public Radio. Stop & Shop returns to the negotiating table with its unions on Wednesday. The state treasurer of Massachusetts has criticized the company's proposals — and she has a unique perspective. After Weeks With No Contract, Stop & Shop Workers Rally In Chicopee, Mass. The union representing Stop & Shop workers held a rally Wednesday outside the store in Chicopee, Massachusetts. The workers have been without a contract since late February, and continue to threaten a strike. Stop & Shop is currently in talks with the food and commercial workers union about a new three-year contract for its staff in western Massachusetts.